From the Links is a golf hall of fame, shame and the arcane. Collected in this handsome volume are more than a hundred of golf’s greatest moments – from the famous to the long forgotten; from the links of Scotland in the 1800s to the 1938 US Open; from the 1954 US Women’s Open to the 2010 Masters, and even to the little known Martini Invitational in 1971 – and starring the giants of the game down to the struggling pros and amateurs. Told in whimsical fashion, these are stories of triumph, amazing holes-in-one and other feats, hilarious gaffes, classic matchups, heart racing final rounds, trailblazing careers, monumental breakdowns, and other incredible events no reader will ever forget: there’s the story of Jack ‘The Golden Bear’ Nicklaus and Gary ‘The Black Knight’ Player being attacked by killer bees on a course in South Africa in 1966; the 1954 US Women’s Open Championship won by the pioneering Babe Zaharias just one month after cancer surgery; the incredible sight of four holes-in-one on the same hole in under two hours in the 1989 US Open. Golf has a singular capacity to bring out the very best and the very worst in its many enthusiasts, with all sorts of mishaps and high jinks colouring the space between tee and green. 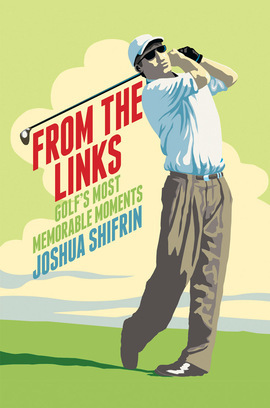 In From the Links, Joshua Shifrin affectionately guides us through the rich tapestry of golfing history with tale after notorious, infamous and beloved golfing tale. Told in whimsical fashion, these are stories of triumph amazing holes-in-one and other feats, hilarious gaffes, heart racing final rounds, monumental breakdowns and other incredible events.